With a graduate degree in Food Science and a background in wine making, Carleton Yoder moved to Vermont in the late 1990s to make hard apple cider. Today, he finds himself in Middlebury making award-wining cheese that is produced using traditional recipes and methods. The milk for Champlain Valley Creamery cheese comes from a single herd of crossbred Jersey and Holstein organic cows in nearby Bridport, Vermont. 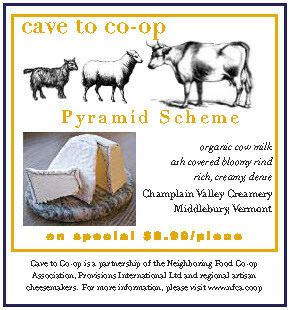 Carleton produces an Organic Triple Cream, Old Fashioned Cream Cheese and recently, Pyramid Scheme, which is a yummy truncated pyramid with a vegetable-ash covered bloomy rind. Similar to Triple Cream, Pyramid Scheme is dense and fudgy with the milky sweetness of fresh Vermont organic cow milk and the added complexity of a tiny tang on the finish. The vegetable ash gives Pyramid Scheme not only its distinct look but also helps to neutralize the acidity, aids in the ripening process and produces a especially sweet and creamy cheese.